Yesterday the 4m TX permission in DL ended for this year. Hopefully we get another one next year. For me it was the first time and it was rather interesting to compare real band opening with the propagation prediction on dxmaps. Unfortunately i missed the big ES in June. I was on vacation and also my transverter was not ready that time. But still i made some QSO. A frequent “beacon” on the band was DK2EA. We had several short qso and it was always a stable connection although we both used low power and small antennas. During the ES openings i worked EA, EI, SV and LZ. I also worked some OK stations and some local stations as well. While i was using my FT-817 as IF TRX last days i hooked up my HiQSDR to the transverter. 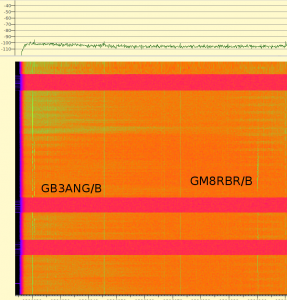 The day before yesterday i noticed some band opening to G. I heard the beacons GB3ANG and GM8RBR. You can see the screenshot below. While GB3ANG was rather stable over a long time GM8RBR more in the north was fading in and out all the time. I also heard GM4ZMK calling CQ. Unfortunately outside the frequency range allowed for TX in Germany. The opening to him was only few minutes. Now i will disassemble my 4m station and switch to other activities. Hope to hear you on this nice band next year. This entry was posted in 70MHz, VHF by mario. Bookmark the permalink.